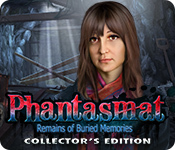 Phantasmat: Remains of Buried Memories Collector's Edition is rated 3.0 out of 5 by 26. Rated 5 out of 5 by p2668 from I Loved it! It's a good thing I didn't listen to all the negative reviews, and decided to try it, because I would have missed out on a really great game. It was really creepy, loved the graphics and story. It's an escape game, which I really like. What gave it the biggest creep factor to me was the music. The music had a kind of "eyes wide shut" kind of vibe, if you saw that movie, and I just really enjoyed it. I also, enjoyed the puzzles. Some were easy and a few were the kind that I enjoy doing. So all in all, I think this is a great game, and you should give it a try, and see for yourself whether you like it. Rated 5 out of 5 by Kikime from Wonderful challenge Sinister nightmare I am finding the story to be refreshingly original, yet easy to follow, having just the right inter-dimensional sinister spiritual aspects, sometimes shallow, like something is called a “creature” that makes me think of something physical but in dreams symbols of spirit take on physical form and while there is a switch from greys to full colour, it all seems a bit more like dream than reality to me. I was in a low level car accident after all. I like the way the sister is presented before we see her (but I think it would have been appropriate to call her already a husk at this point, after all how far gone is the custodian if he sometimes knows how far-gone he is? or rather if he can be saved by a jostling of the conscience.) I am enjoying the story. It could be even scarier, but is not boring. The background music is kind of scary and cool. Besides that, the voice acting is excellent. Visuals are really as good as they should be. The characters display mixed complex emotions well visually. They look good in the wallpaper too, whereas ordinarily I dislike wallpaper based on characters. I wish the other wallpaper pictures were more exciting to me personally, but there is personable concept art and I don’t need wallpaper, anyway. I am especially enjoying the overall visual tone and complexities. I love the theme and general ominous surroundings, especially the little details. The hops were less beautiful than I like, I prefer crisper lines and flashier colours, but had their own look and were cleverly designed, though some clues were misleading to me. I liked that some hops were multilayered. I noticed the two types of bubble game, the one to play when you don’t like finding objects and the other more original kind, the likes of which I have never seen before. Especially nice! I liked the appearance of the signs. I was also quite pleased by the first morph I found, with its high level of detail. There could be more of them. While the minigames are so far fantastic, some with increasing difficulty and quite challenging, others rather easy, just stimulating fun to run into. I am always happy to play timing and accuracy games within games and even more love the challenge of figuring out games like the arrows game, not to mention the increasing levels of difficulty, and would love even more of both. The portals added to the sliding puzzle at the end of chapter one was a nice surprize, too. I think this is an exceptional game. I love the look and feel. 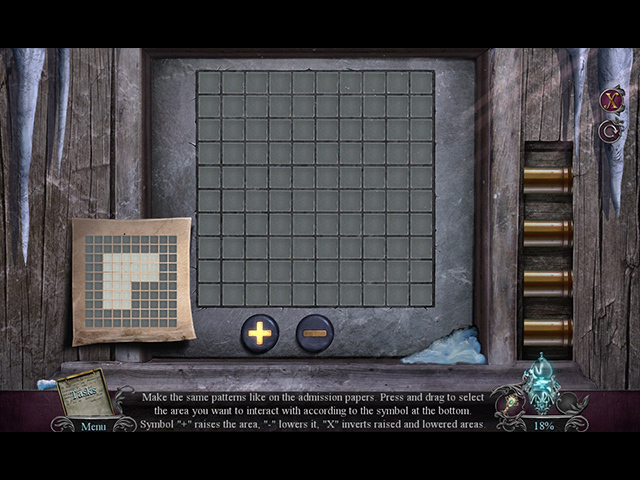 I really love the puzzles and mini-games, so creative, well made, and enjoyable to work out. Thankfully, many nice games are even re-playable. I like not having too many things in the inventory at once, although there are also more condensed zones in the game. It is nice when everything is memorable and logical. I also liked getting to use my short term memory to work with a clue rather than lifting the paper to it. I have my own mind after all. I want to finish the game, but since I have a few other things that need to get done, I can’t yet. I will say that beyond what I’ve played, I did look into the guide and it may be even better when I get to it, but I like what I see or I wouldn’t have gotten it. This is a worthy game. Thank-you. I think it works best with a good attitude, but it’s really one of the better games in my own book. Rated 5 out of 5 by sbechirian from Great great game! Remind me of Dreadful Tales, the new Eipix series. I love the shades in this game and the storyline. I wish the sound and the voice volume would be a little louder, but it is ok for me. 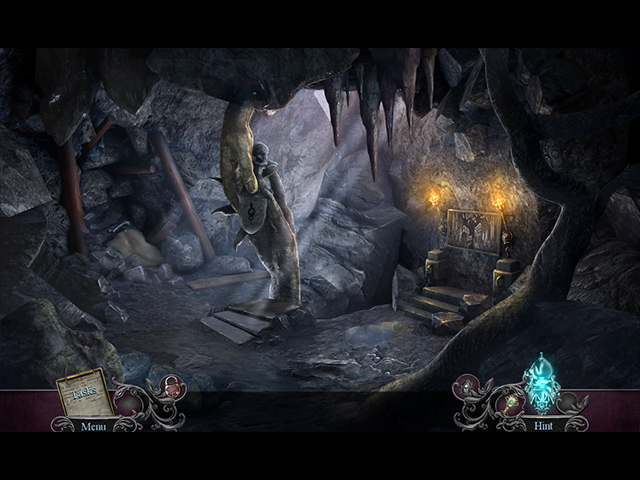 In this game, you have to save your sister in a haunted place, but the creature living in it wants you also. Creepy. Funny. Beautiful. Interesting. I like! Rated 5 out of 5 by silverfairy31 from Weekend treat! I normally don't leave reviews but I will for this one! This game is very entertaining! The last Phantasmat installment wasn't very good but this one is! The story line is strong, graphics are amazing (very spooky!) and the voice-overs are awesome! Rated 4 out of 5 by turnquist109 from creepy creepy I don't get the negative reviews. I thought this game was fun and creepy. I have liked most if not all of the games in the Phantasmat series. It was a great way to spend a rainy cold day! Rated 4 out of 5 by Majestyx12 from When faced with evil, write a letter Based on the finished game with bonus material Loved the story. It's creepy with the stories of the hotel workers and others. Loved the morphs in the hops. I love the list hops and that's what I got. The hops are multi-layered so when to find the morph was hard. I liked the game play. I didn't like any of the mini-games but I play for the hops. The four long chapters + bonus chapters kept me busy for three days as I would stop when I was overwhelmed. The beginning threw me since it started without me setting anything. They call that the prologue in the guide. As far as the guide, I liked the large enough pictures and the finished results for other things. The bonus chapter has my sister Tilly and me teaming up to take on a problem. William fits right in with the story. Replay 21 hops, 20 mini-games, 12 videos and bubble shooter. (I didn't like the bubble shooter) Achievements, 8 wallpapers, 8 concept art, 24 Souvenirs and 45 collectible clocks. I liked some of the chalk drawings in the videos. Rated 4 out of 5 by eedebeep from A good addition to the Phantasmat series. I'm amused by the reviews that say this game is "too dark". It's Phantasmat people, it's supposed to be creepy and dark!! It delivers in the spooky, creepy, macabre theme of Phantasmat. This is a very good addition to the series, just misses being 5 stars. It has some new minigames that I liked ( and I play a lot of HOPAs) , good HOs. It's a decent length for a CE. The villian was a bit weak, however, and the bonus game rushed and predictable. Overall, though, a fun game for those of use who enjoy dark games. Rated 4 out of 5 by codom from A Rare Positive Review for Eipix Something pushed me to give this a game a try, so I bought it. I was very hesitant because I'm not much of an Eipix fan. I'm about 1/2 through it and I really like it so far. Bravo on the non-standard start to the game also! That was thinking outside of the box. The mood and pace so far has kept my interest. My only gripe is that most of the graphics are very grainy and fuzzy. I suspect this is due to compression after production to reduce the game size. I REALLY wish they would cease doing this. Other than that, I will give a rare Eipix recommendation. Rated 4 out of 5 by eyesore from Minority Opinion Hey...just played the demo and plan to purchase. I thought the game quite fun and not stuffed with horrid puzzle challenges every five minutes. 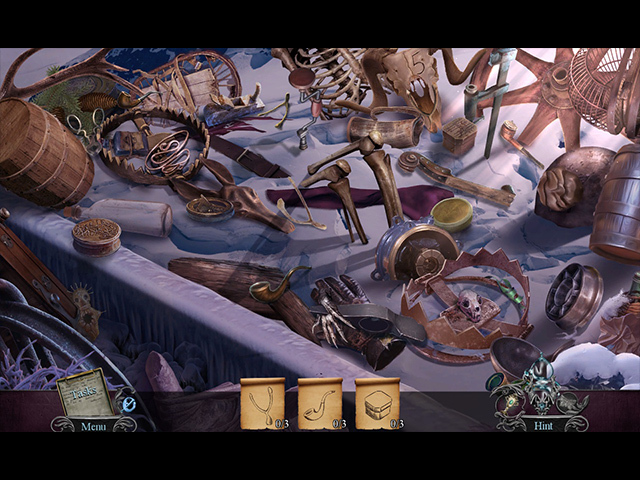 Hidden Object games were varied, and items not always easy to locate.